An easy and absolultey delicious comfort meal perfect for weeknights. 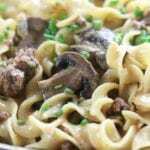 Rich and savory, this Ground Beef Stroganoff is just so good with deep and savory flavors. 16 oz package egg noodles *Look above under questions for gluten free alternatives. Place a large skillet frying pan over med/high heat. Add 1 tbsp oil, all of the mushrooms and thyme. Sauté mushrooms until tender and glossy, about 8 mins. Meanwhile bring a large pot of water to a boil. Once boiling add in about 1/4 cup sea salt and cook noodles according to directions on package. Drain and place noodles back into cooking pot. Add in butter and stir to coat noodles. Set Aside. Place mushroom pan back over med/high heat. Add second half of oil and onions. Sauté until just turning translucent, about 4 mins. Add ground beef and garlic, breaking apart into larger chunks. Cook until pink is gone, about 6-7 mins. Stir into meat mixture paprika, Worcestershire, mustard and beef stock. Bring to a simmer for about 9 mins. Make a slurry of 1 tbsp arrowroot and 1 tbsp simmering liquid from ground beef pan. Stir into simmering pan and continue to cook for additional 5 mins. Add in cooked mushrooms and whisk in sour cream. Take off of heat. Toss in cooked buttered noodles and garnish with chives. To lower calories per serving use extra lean ground beef and nonfat Greek Yogurt.